Despite and especially due to the difficult state of the overall economy, the People's Republic of China is bolstering its construction industry by investing heavily in infrastructure. Exhibitors will present the machines and vehicles that are needed to realize these projects at bauma China 2016. The eighth edition of the International Trade Fair for Construction Machinery, Building Material Machines, Mining Machines, Construction Vehicles and Construction Equipment takes place at the Shanghai New International Expo Centre (SNIEC) from November 22 to 25. Statistics compiled by the economic forecast and market research company Off-Highway Research send a clear message: Sales volume of construction machinery in China declined steadily from its peak of some 435,000 units in 2011 to a good 131,000 units in 2015—a 70-percent decrease within four years. For 2016, analysts only expect a slight increase of about four percent, with sales probably stabilizing at just less than 138,000 machines. By and large, this hope is based on the fact that the Middle Kingdom continues to massively expand its infrastructure. For example, according to the American Association of Equipment Manufacturers (AEM), China invested the equivalent of 130 billion US dollars in railway construction both in 2014 and 2015. According to China's Prime Minister Li Keqiang, the country will invest more than 122 billion US dollars in this infrastructure sector this year, as well. All in all, observers expect that the 13th Five Year Plan, which begins this year, will make a total of some 650 billion US dollars available for railway construction between now and the year 2020. The People's Republic hopes that investing in the transportation infrastructure will not only give its economy a new boost, but also eliminate deficits that, among other things, have resulted from urbanization of the country, which continues to increase. For instance, according to Germany Trade & Invest (GTAI), 65 percent of all Chinese people will probably live in cities by the year 2020 (2014: 54.8%). So it is quite fitting that Beijing wants to expand its subway network, which is currently 527 kilometers long, to 1,000 kilometers, for example. Expansion of the country's highway network, which has also been intensified, is resulting in higher demand for road-construction machines. For example, according to GTAI's statistics, Chinese production of compaction rollers increased by 17 percent during the first eight months of 2015 compared to the same period in the previous year. New emission regulations are an additional incentive to purchase new construction machines: As of April 1, 2016, all diesel engines used in off-road machines in China must comply at least with China's minimum Emission Standard III. According to the Chinese business magazine “Economy & Nation Weekly,” this more stringent requirement means that some 2.5 million old construction machines may no longer be used in China. As a consequence, demand for machines that are more environmentally friendly is expected to increase sharply. 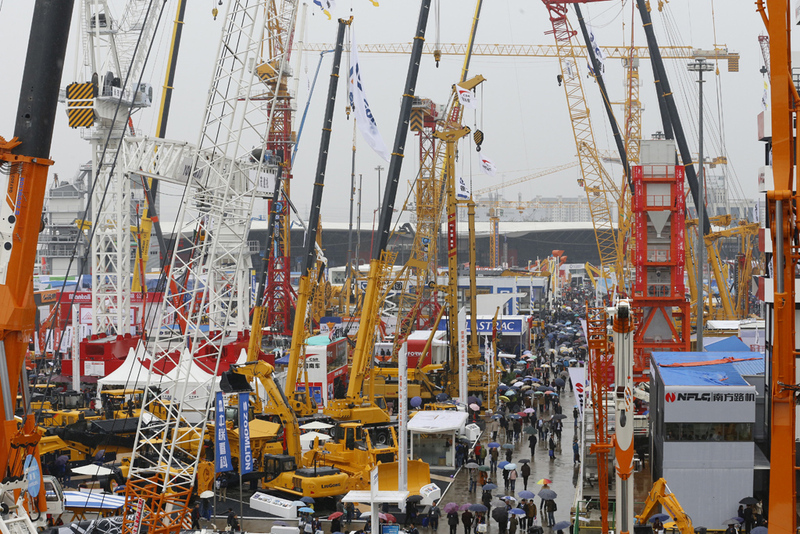 A good seven months before bauma China, that is certainly good news for potential exhibitors and visitors alike.